Uma das razões que me faz não gostar nada de chuva é que nos corta os planos todos, incluindo tirar fotografias, por isso hoje mal vi que havia sol fui tirar algumas. Encontrei esta camisola na Primark, e adorei por causa dos detalhes das pérolas que tem. Não sou nada destes looks "school girl" com as meias pelo joelho e saia, mas não resisti em usar a camisola assim, gostei imenso! Como é que tem sido o vosso fim-de-semana? One of the things that makes me dislike so much rainy weather, is the fact that it kills all of my plans, including taking some pictures. So today as I woke up and saw the sun was out I decided to take these pictures. 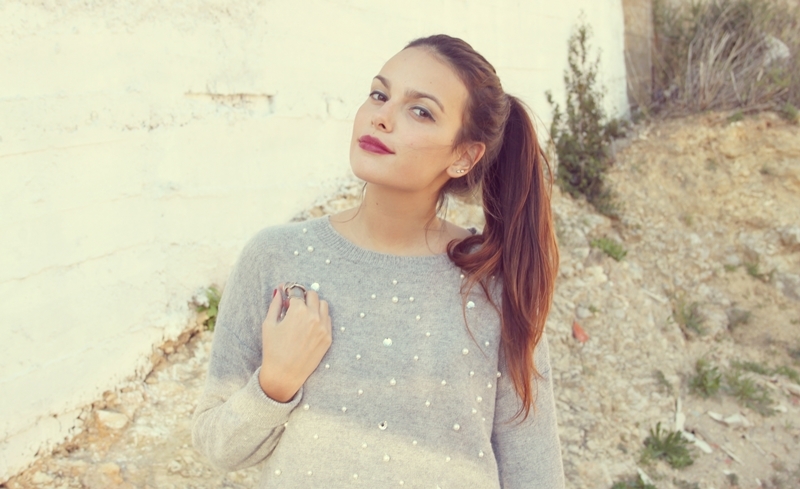 I found this sweater in Primark, and I like it so much, specially because of the pearls. I'm not the kind of girl that wears these "school girl" outfits a lot, but I like to see these knee-high socks with the skirt so much! How is your weekend going? a camisola é amorosa e tiveste toda a razão em conjugá-lo com "school girl" look, ficou amorosissimo! tas linda, adoro ver meias assim! Gostei tanto!! A camisola é linda!! I personaly love the rain, although I admit it can ruin your day sometimes. Looking lovely as always Mafalda. Amazing look! Very beautiful sweater! I love your blog and you have a great style! I love this jumper, it's gorgeous! And it looks perfect with these socks and pleated skirt! Leva seguindote un tempo e gustame moito a manera na que te fotografías, e o gusto que tes a hora de vestirte. Eu acabo de comezar cun blog se queres pasarte deixoche a dirección.